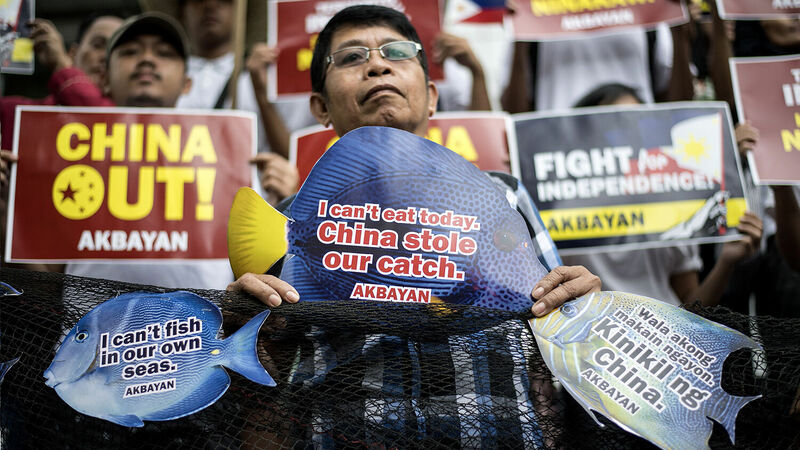 Activists hold placards during a protest in front of the Chinese Consular Office in Manila on June 11, 2018. Chinese fishing fleets have seized control of a string of sandbars near the Philippine’s Pag-asa Island in the South China Sea, Inquirer.net reported on March 4. “[T]hat’s supposed to be ours,” del Mundo said. International law agrees with del Mundo’s statement: Pag-asa lies within the Philippines’ exclusive economic zone. The United Nations Convention on the Law of the Sea says waters within this zone are part of a nation’s maritime territory, and any natural resources found within them belong exclusively to that nation. Most countries use this international law to determine their maritime boundaries. But China is a major exception, especially when it comes to waters in the South China Sea. China claims almost all of this sea as its own. In recent years, it has asserted increasing de facto control over parts of it. Now the Chinese appear to have set their sites on Pag-asa (also called Thitu Island), the largest of nine features in the Spratly Islands claimed by the Philippines, and the home of hundreds of Filipinos. Besides China muscling Filipino fishing boats out of the sandbars near Pag-asa, del Mundo said Chinese helicopters have also recently been spotted flying over the island itself. “Stunned residents and even the military stationed on the island went out of their houses and barracks when they heard a loud noise coming from the helicopter,” the Inquirer paraphrased del Mundo as saying. The mayor said the Chinese helicopter flew only “a little higher” than the island’s tower, which is less than 100 feet high. This was significant because the Mutual Defense Treaty stipulates that both nations would come to each other’s aid in the event of an attack on either, but before Pompeo’s statement, the U.S. had never specified that the treaty would be activated by an attack on a Philippine feature in the disputed South China Sea. As such, Pompeo’s announcement is unlikely to change the overall trend in the South China Sea of the U.S. growing weaker and of China growing more powerful and more willing to use its power. Nevertheless, the statement was unsettling to China and may have played a role in its decision to flex its muscles near Pag-asa. Mr. Flurry’s understanding of the South China Sea scenario is built on Bible prophecy. In the book of Deuteronomy, God warns the nations of Israel that if they reject Him, He will hand control of the world’s strategic sea gates over to their enemies. And He warned that these enemy nations would use that control to besiege the nations of Israel: “And he shall besiege thee in all thy gates, until thy high and fenced walls come down, wherein thou trusted, throughout all thy land …” (Deuteronomy 28:52). To understand more about this “spectacularly good news,” order your free copy of Mr. Flurry’s book Ezekiel: The End-Time Prophet.